The Transition movement is hundreds of communities in 34 countries – a global grassroots network of people taking positive, creative action to build local resilience. 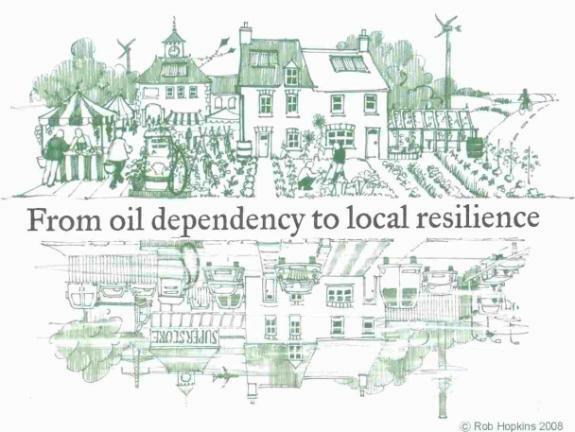 Neighbors come together to create a stronger community, improve economic well-being, reduce oil dependency, and increase local food production, local energy, local jobs, mutual support, and security. In the face of multiple, complex challenges and change, the Transition is a positive, thoughtful, engaging and effective response that helps people work together to improve their quality of life. Every community is unique and creates its own transition. The Transition Network enables us to share our experiences, strategies and solutions. Curriculum: The course describes how to initiate, support and facilitate community transition and greater resilience. It is full of imaginative and inspiring ways to engage your community, and delves into both the theory and practice of Transition that is helping thousands of communities in the U.K. and around the world. Who should attend: People wanting to help transition their community to greater resilience and mutual support. People already creating a Transition Initiative who want to deepen their work and make new friends! Cost: $125 before October 1st; $150 afterwards. A $100 deposit holds your place. Saturday lunch, refreshments and materials included. If you can donate extra money for scholarships, your generosity will help those with low incomes to attend! Bring a friend and both of you receive 10% off! Registration/Questions: Maura Stevens. E-mail mstevens@firstchurchlongmeadow.org or leave a message at 413-567-6287. Send registration fee made out to TRANSITION US to training organizer Maura Stevens, 733 Longmeadow St. Longmeadow MA 01106. Endorsed by the Commission for Mission & Justice.